This is the picture Roger Federer and Rolex really want you to see in your morning newspaper a couple of weeks from now. A broad smile, the Wimbledon trophy held aloft, his Rolex Perpetual Calendar Day-Date glinting softly in the late afternoon sun. He has just made it through round one of Wimbledon 2011 in a straight sets victory over Mikhael Kukushkin of Kazakhstan. Only a few more rounds to go and he could be in with a chance of being Wimbledon champion for the seventh time. To do that he will have to beat Nadal, possibly Djokovic or an unknown quantity who just happens to have an extraordinarily good day. 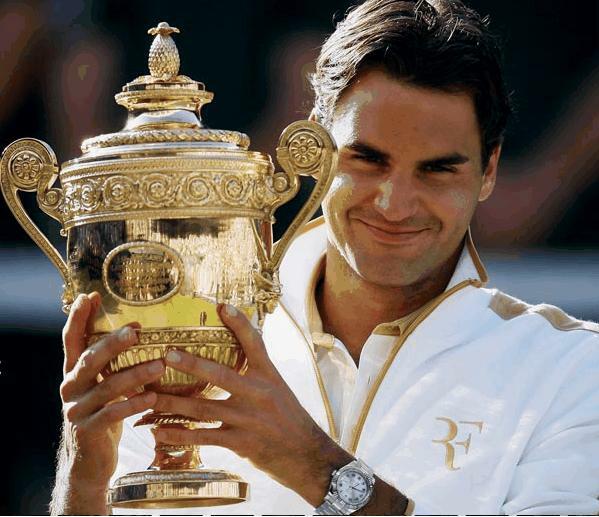 As one of just seven tennis players to win the career Grand Slam, Federer has demonstrated a love of the game that transcends mere tennis – it propels him into hallowed halls as one of the top sportsmen of all time. But win or lose in two weeks time, Federer will still be the perfect ambassador to Rolex and a clutch of other premium brands. Sometimes life can be unfair. Roger, who is currently merely the world number three, made a staggering US$61 million in 2010. Rafa Nadal, the world number one, had to get by on a comparatively paltry US$27 million. What makes Roger so uniquely attractive for Rolex and other multinational companies is the fact that he is Swiss. Switzerland is a small country with which one associates loyalty, luxury, precision and perfection. Whether Federer is in France, Asia, the United States or elsewhere, he’s welcomed as though he were at home. It’s as though the country’s neutrality makes him a global citizen. As far as Rolex is concerned it’s a match made in heaven. Rolex watches have been made in Switzerland for generations. Secondly, Rolex has sponsored Wimbledon for decades. What better than to have a tall dark and graceful tennis player with a smooth and media friendly image. Roger’s scandal-free family-oriented life makes him a sponsor’s dream. Not only that, he is more than a little handy with a racket, and he holds the record for the number of grand slam titles held by a male player. According to the Swiss business magazine Bilan, Federer, winner of a record 16 grand slam titles is sitting on a fortune worth US$327m, putting him among the 300 richest Swiss. At 29 there may not be too many Wimbledon’s left for Roger, but you can be sure, time and a whole heap of money will always be on his side.